The AGA Masterchef XL displays timeless design quality that enables it to fit into any style of kitchen. It's classically simple, understated appeal will match any taste, from the contemporary to the traditional and is available in a choice of five colours to suit your kitchen décor. The AGA Masterchef XL is available with an induction or gas hob, together with three ovens and a glide out grill. 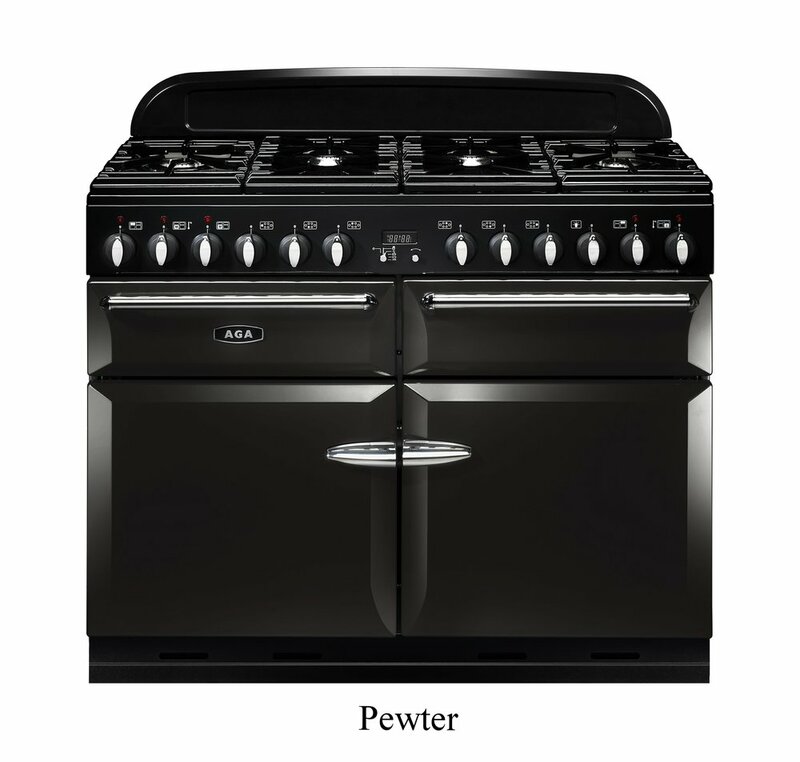 It is the epitome of understated elegance, perfect for anybody who aspires to owning an AGA but prefers the instant control of a conventional cooker. 'A' rated for enery efficiency. Separate grill compartment with a glide-out grill system. Two ovens - one fan, one multifunction, to offer extra flexibility and high volume cooking capability. Multifunction oven offers - fan oven, conventional oven, fan assisted oven, base heat, fanned grilling, browning, defrost and rapid response. Choice of six-burner gas hob (Masterchef XL110), a five-burner gas hob (Masterchef XL 90) or a five zone induction hob - for complete cooking flexibility. Separate griddle plate and wok ring are included on gas hob model. The AGA Masterchef XL has a five year part and one year labour warranty. Positioned on smooth-action telescopic runners, the glide-out grill does exactly that. Not only is it easier to check up on your food as it's grilling but it's also safer, as it reduces the risk of pulling the grill out too far. This large multifunction oven offers - fan oven, conventional oven, fan-assisted oven, base heat, fanned grilling, browning element, defrost and rapid response functionality. Thermostatic control for gentle cooking of dishes such as casserole or drying out meringues. Also ideal for keeping food hot prior to serving or for warming plates. The large 69 litre (Masherchef XL 110) and the tall slim 67 litre (Masterchef XL 90) ovens are suitable for baking and roasting. With six gas-burners on the Masterchef XL110 and five burners on the Masterchef XL 90, the gas hob provides the optimum heat level to suit your type of pan or style of cooking. There are four sizes of burners, varying in sizes from 1KW to 3.5KW. The induction hob is comprised of five zones, in each zone the standard maximum power is between 1.15KW and 1.85KW. However, a boost function enables the maximum power to reach between 2KW and 3KW offering improved flexibility and controllability.